Reports have linked auto task force chief Steven Rattner to a complaint that his firm used payments to obtain New York state pension business. WASHINGTON — Steven Rattner, chief of the Obama administration's automotive task force, was described in media reports as the executive who arranged for his firm to pay more than $1.1 million to obtain New York state pension business. The issue surfaced last week in a Securities and Exchange Commission complaint. The SEC document alleged that "a senior executive" of Quadrangle Group, the private equity firm Rattner co-founded, met in 2004 with a New York state official to solicit an investment. Quadrangle secured that pension-fund investment of $100 million, the complaint said. The SEC said a Quadrangle executive was involved but did not name Rattner. However, The Wall Street Journal and The New York Times reported last week that Rattner was that executive, citing unnamed sources. Rattner, 56, and Quadrangle have not been accused of wrongdoing. But the disclosure could complicate the Treasury Department's bailout negotiations with General Motors and Chrysler, which already are steeped in uncertainty, an analyst said. "It could be a significant distraction from a political standpoint," said Dave Cole, chairman of the Center for Automotive Research in Ann Arbor, Mich. "There is still huge uncertainty, and the intrigue grows with the investigation of Steve Rattner." The SEC and New York Attorney General Andrew Cuomo have been investigating to determine whether dozens of investment firms made payments in exchange for investments from the New York State Common Retirement Fund. 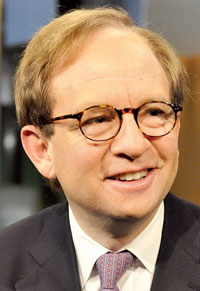 President Barack Obama has full confidence in Rattner, a White House spokesman said Friday, April 17. "He's not accused of doing any wrongdoing, and he's not likely to face any criminal or civil charges as it relates to this," Obama spokesman Robert Gibbs told reporters on Air Force One. "And a pending investigation was something that he brought up to us." A Treasury spokeswoman said Rattner would have no comment. She added that "during the transition, Mr. Rattner made us aware of the pending investigation." A Quadrangle spokesman said, "Our expectation is that no action will be taken." The main legal issues are whether the investment firms' executives knew or should have known that fees they paid to a middleman to obtain the pension fund investments were legitimate. The investigators also want to find out whether those fees were properly disclosed, according to a person knowledgeable about the probe.